Ashlyn Moody and Stephanie Hayne. 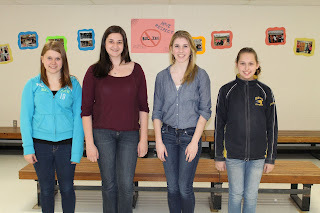 Four students from Blackville School were recognized in their respective grade levels at the French Oratory Contest in Bathurst on April 17. Stephanie Hayne placed third in Grade 7 Post-Intensive French. Cameron Hambrook placed first in Grade 8 Post-Intensive French. Ashlyn Moody placed first in Grade 9 Post-Intensive French and Cassandra Waugh placed first in Grades 11 and 12 Core French.